Frugal Mom and Wife: DIY Magnetic Refrigerator Art Frame! DIY Magnetic Refrigerator Art Frame! My kiddo sure does love to create all sorts of things on paper. She brings home many masterpieces from school throughout every week and she sure is talented. I bet you have a talented kiddo too. Showcasing their art work is a great way show them your proud and want everyone to know it. This helps them take pride in their art and keep your fridge surface looking organized. Our refrigerator displays her masterpieces usually with a simple magnet. Not anymore, I decided to go one step further. Below you will find the most easy tutorial on how to make your own Magnetic Refrigerator Art Frame! STEP 1: Remove glass and insides of picture frame and discard, leaving only a frame. STEP 2: On the backside of your frame superglue the heavy duty magnets on all sides on the frame. (Shown below) Allow to set/dry for 24 hours. STEP 3: Place frame over your child's art and attach to your fridge. Viola, Framed Art! * You can choose to keep the glass and simply super glue it into the inside edges of the frame and let set/dry for 24 hours. My child likes to move her art around and a simple frame dropped is much safer than one with glass. No risk of broken glass. * You can also cut a piece of plastic and replace the glass piece. This allows your art to be front protected and your kiddos without the risk of glass. * Paint the frames yourself to give a personal touch. You can get your kiddo to decorate their own frame and display art within their own masterpiece. * You can find everything you need at your local craft store like Michael's or Hobby Lobby. Disclaimer: This post does contain affiliate links. What a great idea! I love it. This is such a cute idea! 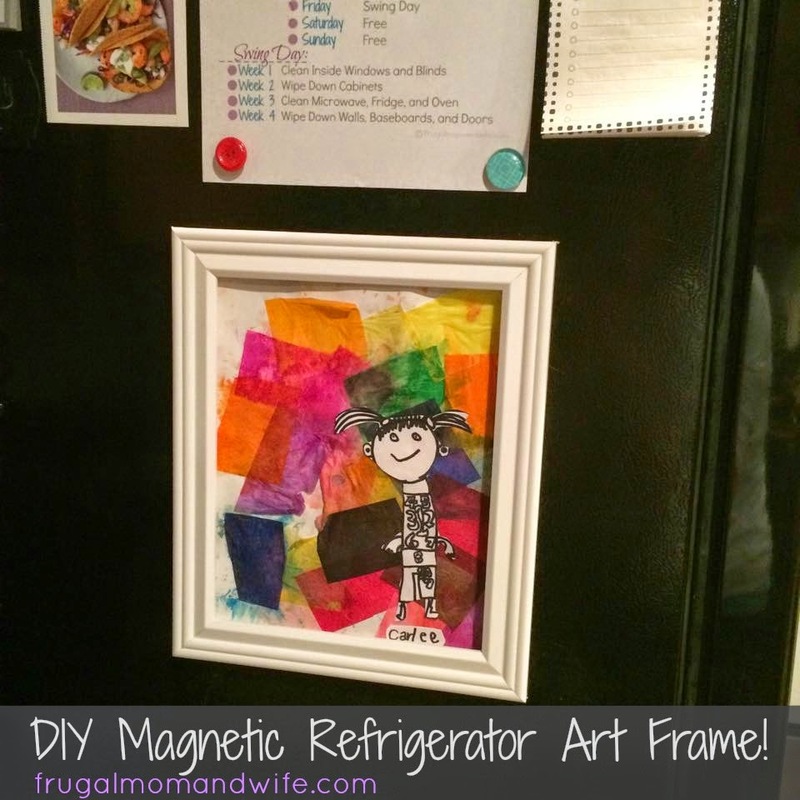 I know my kids would love having their artwork "framed"...it does make it more of a masterpiece than just having it haphazardly sliding down the side of the fridge with old magnets covering up half of it! What a great idea and I bet this would be so much fun to make. What an adorable idea! Would love to have one of two of these on my fridge! Very cute and looks pretty easy to make! How cuter! I'd love to try this out with some old school art. What a cute idea. I have my kids artwork everywhere and it's too crowded! So cute!! Love this idea! This is a really cute idea! I have a frame or two lurking in a closet that might be perfect for this craft project. This is adorable and such a great DIY idea! I could do this and I am glad you mentioned replacing the glass with plastic because that's exactly what I was thinking - what if the glass fell? You solved that with plastic. If we didn't have stainless steel, I'd so try this. Adorable! Nice idea! Sounds like a easy to do project as well. What a great idea. I don't know if it would work for my son's art though since what he brings home from school is always so large. This is super cute! I absolutely LOVE how it came out. I think I might need to give this a try! This would be awesome to make these magnetic frames with the kids indeed. I love making things like this because you can always change the pictures. A frame would be a prefect Mother's Day gift. Thanks for sharing.